The W.A.B. 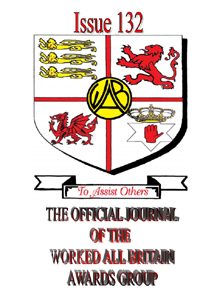 Newsletter, which is the official journal of W.A.B., is published four times a year and is available on separate subscription from the Newsletter Editor (see link to Application Form below). Subscriptions can now be made using PayPal - click on the Price List link for your location in the side menu, then click on the Subscribe button in the Newsletter section. The W.A.B. Newsletter publishes all Awards issued and all Book Numbers sold. New Awards introduced will be described, together with all the requirements. Information about decisions made at W.A.B. Committee Meetings will be detailed. Information about W.A.B. activity will be included. Contributions for inclusion are always welcome. Letters received by the W.A.B. Newsletter Editor describing forthcoming events or stories of past events will also normally be published. Advertisements may also be accepted for inclusion, contact the Newsletter Editor for details. See Current W.A.B. Committee.